BlueBet is one of the newest and most exciting betting agencies to launch within Australia in the last few years. Founder of Sportingbet.com.au Michael Sullivan has introduced BlueBet to Australia with a host of industry professionals behind him and over 30 years’ experience in the gambling industry. Find out more in our full BlueBet review. Punters familiar with the old SportingBet colours and layout will notice straight away that the BlueBet model is quite similar. 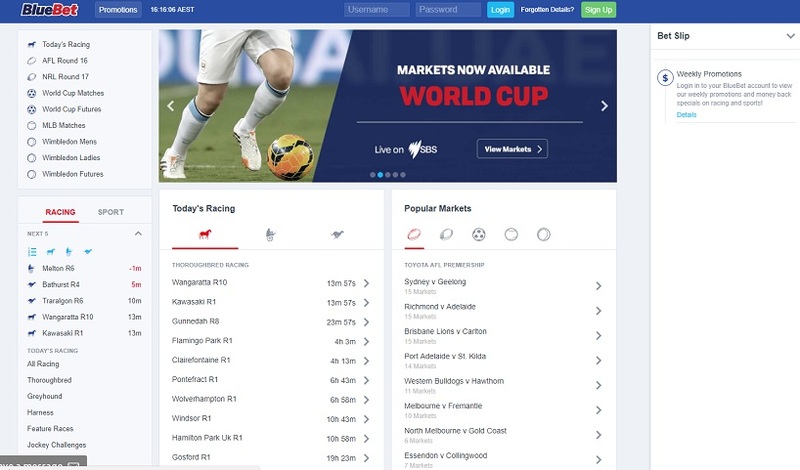 Like the SportingBet of old, the layout is extremely easy to navigate and to use, making signing up, depositing and placing bets a simple task. Contrary to most Australian punting sites, BlueBet doesn’t have a major focus on horse racing. Sure, they offer an extensive range of racing markets, however, their home page is filled with plenty of great sporting markets right alongside their racing information. A great feature of BlueBet is an extremely detailed ‘Activity Bar’ on the right-hand side which displays all of their current promotions with links to more details. It also displays tips for upcoming events as well as your bet slip/pending bets. BlueBet’s customer service is also right up there. They respond to emails within minutes and have a live chat feature that can be activated from the bottom left corner of any BlueBet screen anytime during office hours. Depositing and withdrawing is also simple at BlueBet. They offer services such as Credit Card, BPAY, POLi and Bank EFT to transfer money and withdrawals can be cancelled from the website for a period of time after the initial request. All in all, BlueBet have definitely done well enough to get off the ground and are now a respected sports betting site in Australia and a great alternative to the standard major players like Sportsbet, CrownBet and Ladbrokes. BlueBet offer a competitive 100% up to $200 sign-up bonus. Eligible punters will receive this bonus to use as bonus bets when they make their successful first deposit. To ensure you pick up the full BlueBet sign-up bonus, new punters must deposit at least $200 which will be matched at 100%. So basically, deposit $200 and have $400 to bet with! If you don’t wish to pony up a $200 deposit to begin with, then BlueBet will match any deposit amount up to $200. That means a $50 will net a $50 bonus, or a $100 deposit will receive a $100 bonus, etc. Editor's note: Take care when signing up to new sports betting agencies. Be sure to read all terms and conditions of any bonus offers, deposit/withdrawal requirements and identification verification on each respective site, as some of the information on this page may be outdated. Before You Bet will do their best to keep this page up to date, but takes no responsibility for any information on this page being incorrect.